- Replacement headphones for the Sony MDR-IF330RK and MDR-IF230RK; works with your existing transmitter. - Second pair of headphones for the Sony MDR-IF330RK and MDR-IF230RK; enables two people to listen at the same time. - Cordless design lets you move around the room and still enjoy music or TV sound tracks; lets you turn the volume up late at night -- without disturbing anyone else. - Light weight so you can wear them comfortably for hours on end. - Open-air design lets you continue to hear ambient sound. - 30 mm diameter drive units are larger than many portable headphones for deeper bass, lower distortion and wider dynamic range; frequency response extends down to a low 18 Hz. - Up to 100 hours of battery life with optional AA alkaline battery. - PET diaphragms ensure high rigidity for minimum distortion; low mass for extended high-frequency response out to 22,000 Hz. - Ferrite magnets combine high energy and small size, for ample sound output. - Wide headband with a separate self-adjusting band conforms precisely to the curve of your head; stays comfortable, even after listening for hours on end. 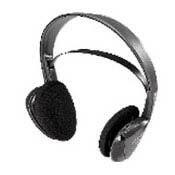 - Mute function to avoid noise through the headphones; cuts out the sound when no audio signal is available. - Automatic power switch conserves battery life; the headphones turn on when you place them on your head. - Single volume control in one earpiece conveniently adjusts the volume for both channels. I love this product. I am ordering another pair because I dropped it and can't blame it considering all the use and abuse I've put this poor thing through, The automatic turnoff feature afforded by the inner headband is an excellent design feature. I can't remember the last time I had to change its batteries. I like the fact that I don't have to park it in a base unit to recharge it Who needs to recharge something runs on two AA batteries for what seems to be forever. I just throw the headphones in my bedside table and when I need them they're nearby and ready to go. It's low price and very good sound is a great value. They may not have the quality of my Sennheiser TR-130 headphones which have surround sound. They were great until they broke in half, this time without being dropped or abused. Since purchasing them a few years ago, the TR-130 has doubled in price but with one important difference. Although Sennheiser maintained the TR-130 model number, they removed the all important surround sound feature. Now if you want surround sound you have to buy their RS-170 model which lists for $280. "But isn't that illegal?" you ask. Well, apparently not in Germany or at least not for products exported to he US. I found out about all this the hard way when I recommended the TR-130 to a good friend and asked if he was enjoying the surround feature? He gave me a confused look and asked "What surround sound". "Oh. You probably didn't notice the surround button on the bottom of the unit. He checked and found no such button. These headphones are super clear and provide amazing range! I use them at home for mowing the lawn, watching TV when everyone is asleep, cleaning up around the house, gardening, etc. I love these things!! I would recommend them to everyone.